Nexenta’s solution portfolio is 100% software-based for both on and off premise settings. As companies adopt new enterprise architecture options that include block-only storage and hyper-converged infrastructure to improve performance and simplify deployments but over time there is a need to expand the workloads but run into challenges due to not having file based storage services. 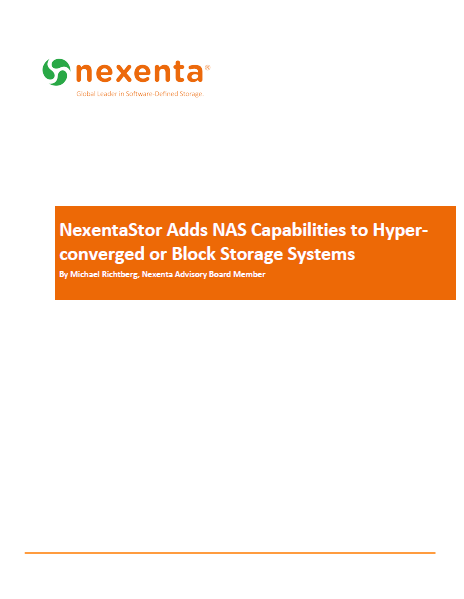 Please fill-out the form below to receive your complimentary copy of the NexentaStor Adds NAS Capabilities to HCI or Block Storage Systems white paper.